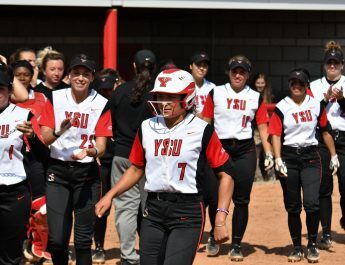 The Youngstown State University baseball team scored four runs in the top of the ninth and survived a scare in the bottom half of the inning to outlast Eastern Michigan University for a 9-7 win on Tuesday. After starting the year 1-14, the Penguins are now 5-17 and have found a bit of luck as of late. Both starting pitchers were knocked out after two innings. With the Penguins trailing 7-5 to start the ninth, Nick Massey, Jeff Wehler and Blaze Glenn drew three straight walks to load the bases with one out. Massey scored on a fielder’s choice to cut the margin to one. Zach Lopatka’s two-out double brought in Glenn with the tying run. After Drew Dickerson walked to load the bases again, Austin Trace plated pinch-runner Lucas Nasonti with an infield single that proved to be the winning run. Lopatka then raced home on a passed ball to give the Penguins an insurance run and a 9-7 lead. EMU certainly had a chance in the ninth as it loaded the bases with nobody out. Dalton Earich didn’t allow a ball to leave the infield as he retired the next three hitters. Earich struck out Kolton Schenker for the first out, and the freshman reliever then threw out a runner at the plate on a grounder back to the mound from EMU’s leadoff batter. Max Schuemann then grounded out to second base on a full-count pitch for the final out of the game. YSU’s only lead until the ninth was 1-0 after Massey doubled and scored on Glenn’s RBI single in the top of the first. The first three Eagles batters all reached in the bottom of the first, and John Rensel Jr.’s home run put EMU ahead 3-1 after there was an out in the inning. EMU got a pair of RBI singles in the bottom of the inning to go up 5-3, but the Penguins struck right back again as Glenn’s two-run home run with one out in the top of the third tied the contest at 5-5. Luke DeVenney’s solo homer in the bottom of the inning put the Eagles up 6-5, and they added a run in the sixth on an RBI double by Rensel Jr.
Austin Butler came in to get back-to-back strikeouts with two Eagles in scoring position in the sixth to keep the deficit at two, which allowed the Penguins to have their rally in the ninth.